The Sugar Baby is a 1935 spin-off from the success of the Sugar Daddy made by the Welch Company. In the 1930s, Sugar Babies were young women on whom middle-aged "Sugar Daddies" spent bundles of money. Below is a magazine ad from 1976 which includes the Sugar Daddy (1925) and Sugar Mama (1965). 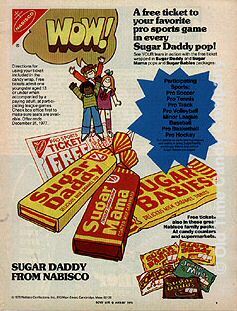 Sugar Daddy is still available but the Sugar Mamas (chocolate covered Sugar Daddies) were discontinued in the 80s. Today the Sugar Baby is made by the Charms Company. I had had my braces for two and half years before the orthodontist took them off. The second I left the tooth-building behind, I headed for the old general store to buy myself some Sugar Babies, which had been the equivalent of contraband with my braces on. Alas! When I reached the store, there was no candy where the Sugar Babies where. The clerk informed me that they were sold out. Still hopeful, I asked the clerk if I could buy from his personal stash, but he said no. After some more wheedling, we struck a bargain: I'd play the fiddle for awhile (I was pretty good at the fiddle) and he'd give me a bag of Sugar Babies.